← Happy 75th birthday, Golden Gate Bridge! On Monday we tried taking the holiday with no plans. What this ended up meaning was that our kids begged to watch movies all day. When we tired of this, we insisted that they go out somewhere with us. Their first few choices were closed for Memorial Day. Eventually we settled on the zoo. The beach wants the Great Highway back. Eventually it will prevail. The San Francisco Zoo is at the southwestern corner of the city and far enough away that we’ve never ridden there before. But we’ve been expanding our range lately, and for the first time ever we didn’t even consider driving. Instead we headed west through Golden Gate Park and then south along the Great Highway, which runs along the ocean at the western edge of the city. There is a multi-user path alongside the Great Highway. But we didn’t need the path. 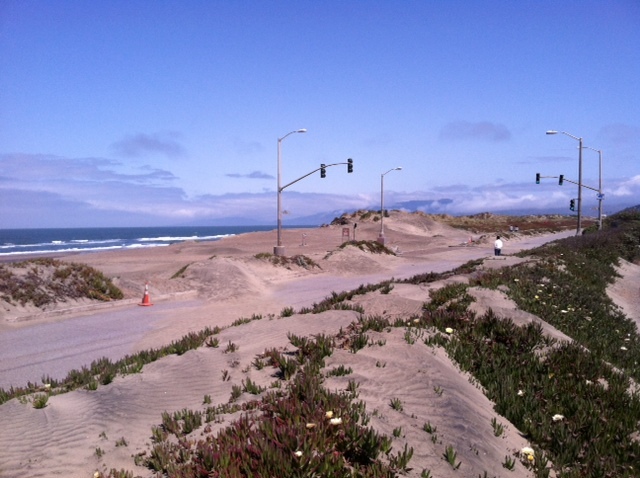 The Great Highway is constantly overwhelmed by blowing sand, and closed to cars increasingly often as it piles in deep drifts along the road. Monday, it turned out, was a surprise closure of the Great Highway all the way from Golden Gate Park to the zoo. Thank goodness we’d ridden our bikes. 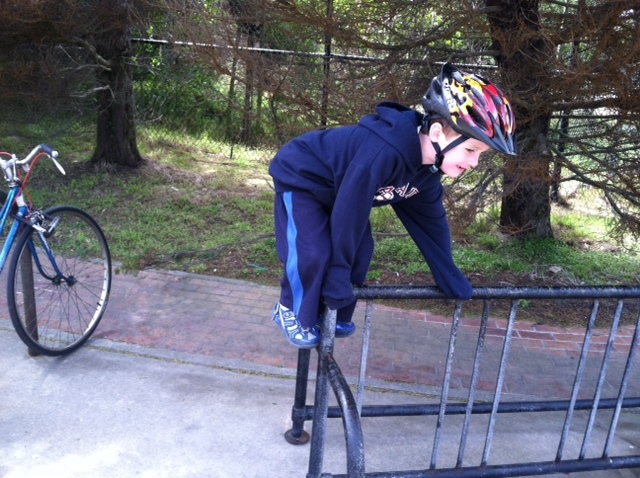 What is it with kids and bike racks? Riding along the Great Highway during the closure was amazing. Usually this road is overwhelming; fast and noisy and terrifying. But on Monday, as we rode, all we heard were birds chirping, waves crashing into the shore, and the laughter of children building sandcastles alongside the road. We stopped to let our kids do the same before meandering on to the zoo. Although we slipped occasionally in the sand, we weren’t going fast enough that we risked falling over. Instead the bikes just stopped moving, and we pushed until we got to clear asphalt again. After arriving at the zoo riding our bikes looked even more prescient. The rate for parking a car is now $10! And the lot was packed. 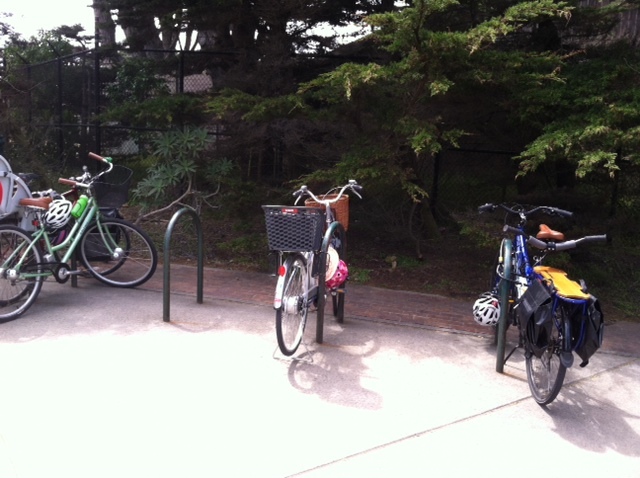 But as usual there was plenty of space available on the bike racks right by the front entrance. The racks overlook the zebra enclosure, and it was hard to convince the kids that there were even more wonders to see if they left the bike racks and entered the zoo itself. But in a way I agreed with them; I enjoyed being outside the zoo more than going inside. Riding along the Great Highway was one of the best trips we’ve ever taken. How far used to be too far? I have been thinking about where we started last year and what we now deem possible and likely, vs. not a chance and you’d have to be committed to try.